Thanks for the update. Unfortunately I’m still encountering the same “out of memory” issues as the previous versions. I’m running a PC with 32GB memory so I’m puzzled about why I’m still getting this error. It almost always starts crashing around the Iowa caucuses no matter the start date or the number of candidates. I’m running a primary with 2 GOP candidates and 5 Dem candidates. I’m not sure why it’s not able to keep up but it’s a problem. Ok, that sounds like it isn’t a general memory issue. To make sure, before you reach the Iowa caucuses can you press Ctrl+Alt+Del, then select Task Manager, go to the Processes tab, and then under Apps look for PI, and tell me what it says under the Memory column? Which campaign and approximately when in the campaign do you get this? Is it consistent? The 68 campaign, like march-ish. I have the save file for the turn before it happened and continuing to the next turn can replicate the error. is there a way to make spacebarring an option besides the ‘n’ key? Because I personally found it easier to spacebar through normal stories and turns? I’m also getting the same error as @Chad above right before the IA caucuses. 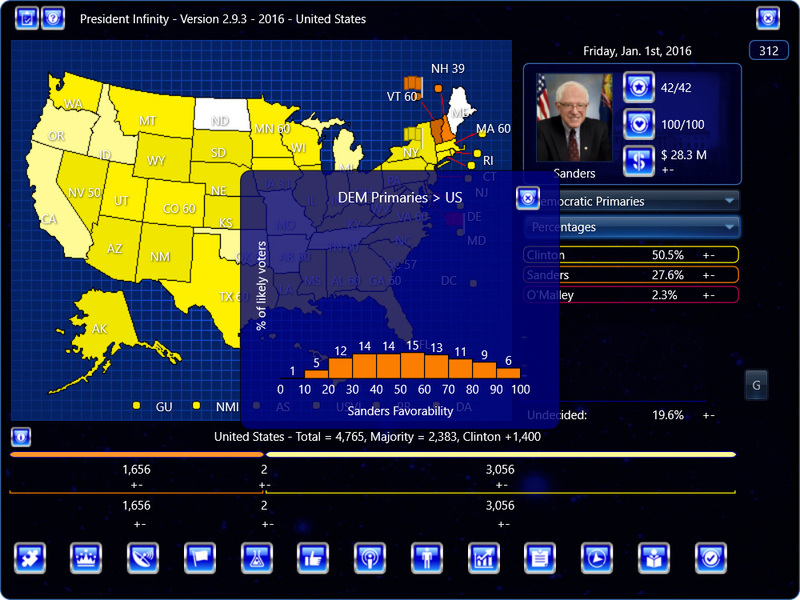 I think the previous memory issues I mentioned may be linked to using an unsupported campaign mod but when I use the 2016 default game I also get that same “Access violation” error on Jan. 28 as it tries to load the Iowa results. @Chad re error, thanks for this – I have replicated the error and it should be fixed for the next update. The spacebar has a standard operation for Windows or Mac when a button (for example) is in focus on a screen. I can override that (as it was being overriden before), but it makes things a bit tricky and isn’t good UI for new users who aren’t used to spacebarring. My experience is that pressing ‘n’ instead becomes as natural as spacebarring after a little while. Ok, please let me know if you get the general ‘out of memory’ error on an official campaign. 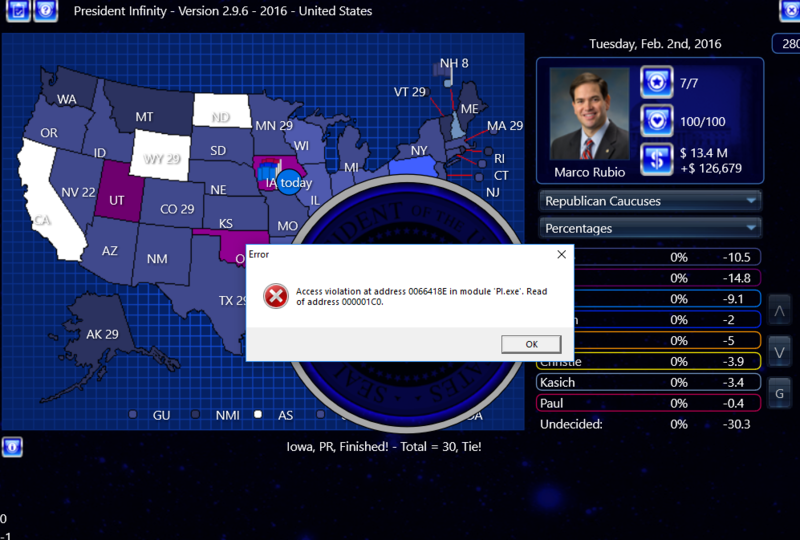 I’m receiving an error right before Iowa in every campaign I have tested it with in the new sneak peak. Getting “external exception EEEFACE” the turn after Iowa on my end. No problems before Iowa. This is on my personal 2020 campaign. This is a confirmed bug, working on a fix right now.